Shooting Gallery is pleased to present Unrestby Ferris Plock. The SF-based artist's fourth solo show with the Shooting Gallery will draw inspiration from the changing face of San Francisco, focusing on Western Addition/NOPA. The opening reception will be Saturday, December 14, from 7-11pm, and the exhibition is free and open to the public for viewing through January 4, 2014. Bringing the work of Niels "Shoe" Muelman in through video and that video's object output tied the show together, and connected it with the other spaces in the show. 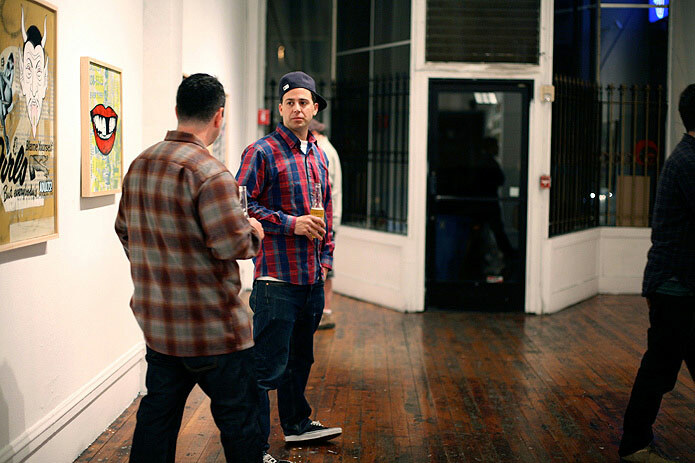 Forgoing the traditional logo of the company, several artists, such as Casey Gray, Chad Hasegawa, and Ferris Plock focused on the checkerboard pattern the company frequently uses, and provided a break from the heavy presence of the icon. Even more solace was provided by Meryl Pataky's Cellar Door which can be seen in the project space. Combining foliage and neon lights, this show reads like the garden outside of a glamorous ball, perfect for the concept of the main gallery and its luxury goods. But no matter how lost you may get in the high-priced world of this show, remember, the Tenderloin is just outside the door. Word to Mother, LV Cat, Mixed media on canvas, 36" x 42"
SAN FRANCISCO --- The Shooting Gallery opened both Madness by Yumiko Kayukawa (Seattle) and Bastion by Aaron Nagel (Oakland) on June 8th with Kayukawa in the main gallery and Nagel in the project space. Kayukawa's work is very interesting, combining a deliberate flatness with immense detail, all perfectly constructed on their canvas supports. She was also there during the opening, approaching visitors and initiating conversations with them, and was a very refreshing and inviting presence. However, I was more attracted to the paintings of Aaron Nagel. They are not only beautiful, realistic portraits but with the inclusion of several small blue dots, the compositions become more complicated and move from basic nudes to a more personal vision of both spirituality and sensuality. These are not the fashion models seen in the front of White Walls, these are real women, and their depiction is executed perfectly, and the blue dots add a distinctive touch. Aaron Nagel, Urchin, Oil on Panel, 20x30"
Aaron Nagel, Bastion, Oil on Panel, 51x40"
Yumiko Kayukawa, KYOUKI (Madness), Acrylic and Ink on Canvas, 22x30"
Yumiko Kayukawa, TEREYA (Shyness), Acrylic and Ink on Canvas, 20x16"
The Shooting Gallery handed over the reins to the Red Truck Gallery (a New Orleans based gallery) which curated their new show, Hard Time Mini Mall and opened the it on Saturday night. This is my favorite show (so far) in the Shooting Gallery's new space and was packed full of art, a mini bar, and cowhide rugs. The Red Truck Gallery chose works with clear craftsmanship and it was easy to see in Ian Berry's denim assemblages and Chris Roberts-Antieau's awesome quilts. The space was completely packed, making it hard to see each piece individually, but this show deserves a second trip anyway. I look forward to spending more time with the chandeliers, automatons, and paintings before the show comes down on May 4th. Chris Roberts-Antieau, The Healing, Appliqué fabric with hand-painted frame, 28"x51"
The Shooting Gallery celebrated their 10th anniversary with a group show packed with people and work last Saturday night. The work is a sampling of the artists who have been with the gallery over the last decade and includes favorites like Ferris Plock, APEX, Robert Williams and Augustine Kofie. The space was stuffed full and people responded by coming out in droves. It was very difficult to get into the back project rooms, but that seemed to be an indication of the success of the night; too many people isn’t exactly a huge problem. The gallery really took advantage of their new space filling every room with work, and if this is what the first ten years looked like, I can’t wait to see what the next ten brings. San Francisco based painter Charmaine Olivia opens the solo show Ritual at The Shooting Gallery on Saturday (7-11pm). She emailed over a few photos of her work and studio taken by Michael Cuffe. She writes that she's inspired by skulls, glass bottles and messy hair. After trying to hail a cab for over an hour on Saturday, we barely made the opening where San Francisco based Ferris Plock opened Just For One Day, his latest in the traditional Japanese style. Acrylic paintings on wood-stained backgrounds/ a modernized recreation of Japanese ukiyo-e wood block prints. Artists and husband and wife duo Ferris Plock and Kelly Tunstall. Due to some crazy SF cab shortage, we just caught the last 5 minutes of the reception. As SF artist Ferris Plock put the finishing touches on paintings for his show Just For One Day (opening Sat @The Shooting Gallery in SF 7-11pm), Shaun Roberts stopped by his studio to have a little look this last Tuesday. Check it. There are A LOT of great shows opening up this weekend and here's another. London based EINE opens up Greatest this Saturday at White Walls. He's been around San Francisco painting roll-ups like the one below filling the entire alphabet. Can you find them all around town? San Francisco, CA-White Walls gallery is pleased to present, 'GREATEST' a solo exhibition by London-based artist, Ben Flynn a.k.a. EINE. 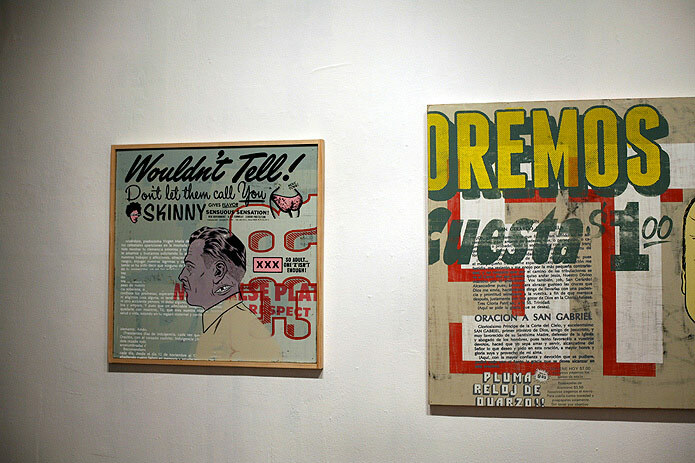 The opening reception for 'GREATEST' will be held on Saturday, March 12, 2011 from 7-11 PM. The exhibition will be on view from March 12, to April 2, 2011 and is free and open to the public. 'GREATEST' is an art exhibition by the artist, Ben EINE, that will utilize both gallery and public space as a two-tiered platform for the artist’s visual expression. EINE'S work is a large-scale study of the shape and structure of the 26 letters found in the modern English alphabet in varied typefaces, color configurations and word arrangements. In the public spaces of San Francisco, EINE will be painting each letter of the alphabet on various walls around the city. A further ten canvases of his work using spray paint, acrylic, and glitter will be on display at White Walls gallery.